The Adobe Creative Cloud is the way that Adobe sells its software and products, many years ago you would choose the software you require for example Adobe Photoshop, you would then buy a box off the shelf with the DVDs to install the software on your computer. Then in a few years time you would pay for an upgrade DVD to update your version of Adobe Photoshop. These days however it has all changed, all Adobe software is sold on a subscription model which means you pay a monthly fee and subscribe to the software you require. This also means your software will automatically update when new versions are released. Common Adobe Creative Cloud myths…. 1. Isn’t all the software is run in a web browser? When you say Cloud based software the presumption is that the software is online and you need to go online and open it in a web browser. This couldn’t be further from the truth with the Adobe Creative Cloud. The first thing you do is download the Adobe Creative Cloud App, then you can choose through this which software you want to download to your computer, just click the software you require and it will install on to your hard drive and start you with a free 7 day trial. 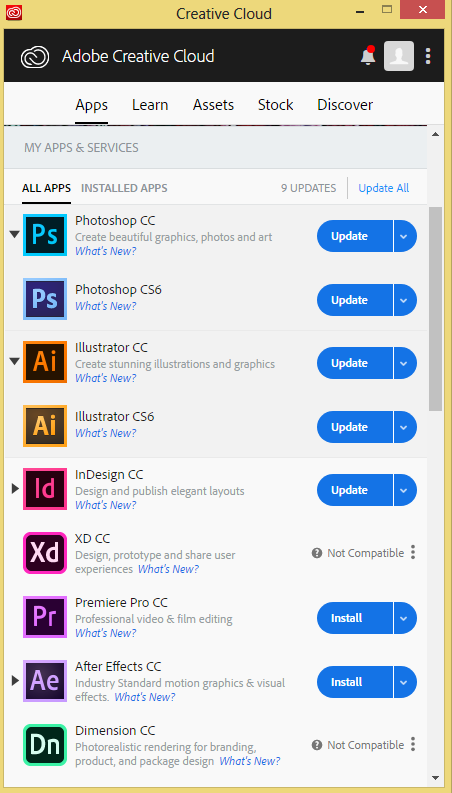 You also use the Adobe Creative Cloud App to make updates to your software. We now know that our software is downloaded to our computer and installed on our hard drive, a common presumption is that you will always have to be connected to the internet for your Adobe Software to work, again this is not true. Adobe does require you to connect online once every 30 days to validate your subscription but you can work offline. So once Adobe has checked your Adobe Photoshop subscription is active you can continue to work with it for a month off line. 3. If I leave the Adobe Creative Cloud I will loose all my files? You always own the files that you have created with any Creative Cloud application, you may have an older version of Adobe Photoshop or Adobe InDesign that you were using before The Creative Cloud and the files will still work with this. The only thing you wont be able to do is open any of the new Adobe Creative Cloud apps through the Creative Cloud Application. Adobe Creative Cloud will also install a folder on your computer called ‘Creative Cloud Files’ by saving files in here it will automatically save them to your personal cloud storage space, this means they are automatically backed up should the worst happen to your computer. You can also install the Adobe Creative Cloud App on your mobile phone or tablet to view your files on the move. You can also share any files in your ‘Creative Cloud Files’ folder with anybody else by sending them a direct link, they do not have to sign up for anything they can just click on the link and view or download the files directly. So once you have downloaded the Adobe Creative Cloud app and installed the software you want to use you are ready to go! After you have used up your 7 day free trial you will need to subscribe to the software. Depending on your need there are a few different options. 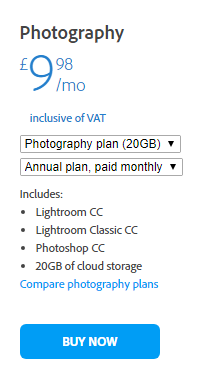 If you are just going to be using Adobe Photoshop there is a Photography package which includes Adobe Photoshop and Adobe Lightroom this at the moment is just £9.98 per month for both of the programmes and 20GB Adobe Cloud Storage space. You can also pay this upfront for the entire year but there is no cost saving for doing this. 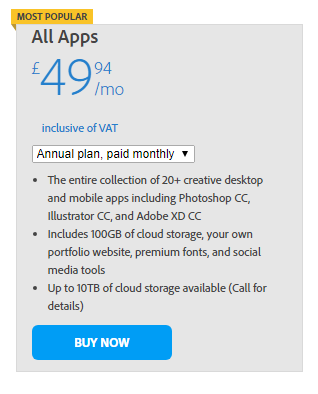 If you just wanted to subscribe to Adobe InDesign or Adobe Illustrator or any of the other single applications they are currently priced at £19.97 per month each, this includes 100GB of Adobe Cloud Storage space. Its fairly common that you would want to subscribe to more than one of the Adobe Creative Cloud Applications. For example if you are a Graphic Designer you will require Adobe Photoshop, Adobe Illustrator and Adobe InDesign. 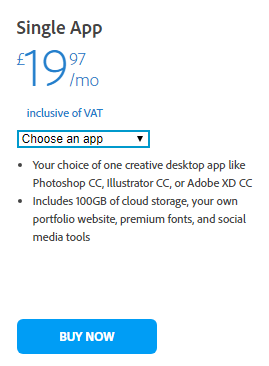 If this is the case Adobe have a more cost effective package that gives you access to every single application that they produce for £49.94 per month. This includes over 20 different Adobe Applications and 100GB of Adobe Cloud storage space. The prices Ive stated are the current ones but they do change, Adobe also have regular promotions this year on Black Friday they had 20% discount off all subscriptions for 12 months! Check out the Adobe website for the current pans and any current offers they have. So I hope this helps to clear up how the Adobe Creative Cloud works, its a lot easier than it sounds just get the Adobe Creative Cloud App downloaded and install Adobe Photoshop, Adobe InDesign or Adobe Illustrator and you are well on your way! All Adobe Creative Cloud Applications are well known for not being very intuitive for the new user, compared to Microsoft Word or Power Point which help you with different templates and force you in to using their generic designs. You can be a lot more creative with Adobe InDesign than you can with Microsoft PowerPoint but you do need to learn Adobe InDesign correctly to avoid getting frustrated. If you are interested in getting up to speed with any of the Adobe Creative Cloud Applications check out our upcoming courses, we can also train you with our online courses or if you would like to have a quotation from us to come to you and train in your own offices just fill out the form below and we will get back to you with more information and a no obligation quotation.